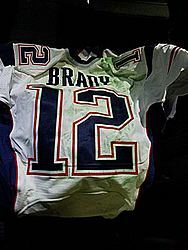 BOSTON (AP) — Tom Brady's stolen Super Bowl jerseys are back with the New England Patriots. The FBI in Boston announced that jerseys worn by Brady during this year's Super Bowl and the 2015 Super Bowl were returned to Gillette Stadium Thursday. Brady's 2017 jersey went missing from the Patriots' locker room after the team's Super Bowl win over the Atlanta Falcons Feb. 5. That sparked an investigation stretching from Boston to the Mexican border. Ortega has not been charged in the case and has not commented. In a statement Thursday, Kraft said he looks forward to returning the jerseys to Brady.